Tuesday 14th October, 8pm Stepping into Britain. The early human occupation of northern Europe. Lecture by Dr. Nick Ashton of the British Museum. Fieldwork over the last ten years has pushed back the evidence of early humans in northern Europe from 500,000 to almost a million years ago. Sites on the East Anglian coast in particular at Pakefield and Happisburgh have revealed evidence of stone tools associated with extinct animal fossils and a wide range of environmental data. Tuesday 11th November, 8pm A Hamlet in Hendon – the Church Terrace site from the Mesolithic to the 21st Century. Lecture by Jacqui Pearce. Jacqui is one of the principal authors of our latest book, and tutor of the HADAS Finds Group whose work over many years resulted in the publication of the 1973/74 excavations. Sunday 7th December, 12 noon – 4.30 pm (approx.) HADAS Christmas Party. Buffet lunch. Booking details coming soon. This is a community archaeology project. They are looking for volunteers with archaeological experience who can commit to 3 days minimum over the period. Please check the website for further details. In their infinite wisdom, Stephens House & Garden (formerly Avenue House) decided that given our penchant for delving into and under the ground, we would be happier if we relocated from the Garden Room to the basement. Actually this is a larger and more straightforward space without the awkward nooks and crannies afforded by the Garden Room. 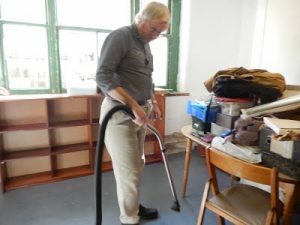 The move took place the week beginning 31 August 2014 and we are still sorting and rearranging books, files and boxes. This should be completed fairly soon and our regular Working Party Sunday mornings restored. We are now located at the bottom of the stairs in the car park. fJacqui Pearce for a thoroughly enjoyable and educational day! On Sunday August 3rd, the culmination of many years work was marked appropriately at ‘The Greyhound Pub’ in Hendon, with the official launch of the book ‘A Hamlet in Hendon’. This tells the story of the HADAS archaeological dig in 1973-74, which was just up the road from The Greyhound, fulfilling Themistocles Constantinides’, our founder’s, aim of finding proof of the Anglo Saxon origins of Hendon. Over 40 members (including Percy Reboul who participated in the dig), former members, contributors and guests gathered to celebrate this tremendous event. Some had travelled many miles to be there. There are too many contributors to mention individually, but our thanks must go to Jacqui Pearce, our lecturer, who has taught and guided ‘The Finds Group’ since its inception, to produce this wonderful book. This class is still going strong on Wednesday evenings from September to March and will be looking at finds from the Arkley kiln in the next session. ‘A Hamlet in Hendon’ is the second book that has been completed and published by ‘The Finds Group’. The first book was titled ‘The last Hendon farm : the archaeology and history of Church End farm’. is now available. Please contact Don Cooper (details on back page) for further information. 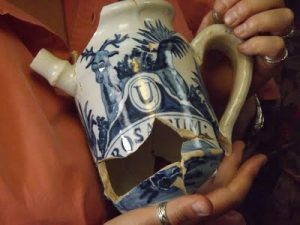 Getting to Grips with Pots and Pipes: the archaeology of everyday artefacts from Saxon times to Queen Victoria – a workshop on 2nd August 2014 at Stephens House & Gardens (Avenue House). Report by Stephen Brunning. Since September 2001 HADAS has been running a successful 22-meeting Finds Processing evening course. I was well aware that not everyone could commit to a full two-terms and the idea was muted for a one day intensive workshop/study day. With Jacqui Pearce at the helm, this went ahead in early August. After a very slow start attracting participants, we ended up with 15 people. Two had come down from Oxford Archaeology for the day, with a further person from Twickenham (AOC Archaeology). Eight delegates were HADAS members. The day was split up with two PowerPoint talks in the morning on medieval pottery & Tudor and Stuart pottery, with a coffee break in between and a chance to ask questions & handle finds bought in by Jacqui from the LAARC. Attendees were also encouraged to bring along artefacts for identification. After a buffet lunch on the terrace (a mistake as it turned out due to a large number of flies interested in the meat sandwiches), we had a two more talks on Georgian to Victorian pottery & An Introduction to Clay Pipes. As in the morning session, the afternoon talks were separated with a tea break and finds handling. The day ended with a final handling session, questions and evaluation. Of the artefacts bought along by attendees, two are particularly worthy of mention here. The first photograph is an oil jar with the U standing for Unguentum (an ointment used to treat dry, scaly or chapped skin), and Rosarium (a rose garden); therefore the vessel is an apothecary jar for oil of roses. Further research is ongoing to establish its date and source. 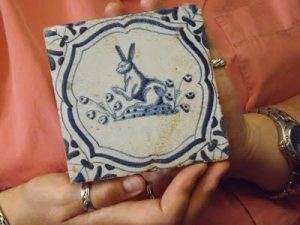 The second photograph is a Dutch Delftware wall tile (1620-1640) as identified by Ian Betts, Ceramic Building Material Specialist at MOLA. Many thanks to Jacqui Pearce for a thoroughly enjoyable and educational day! 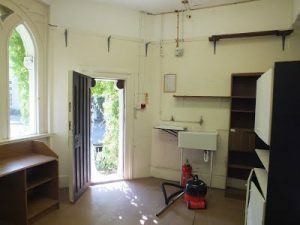 I am sure most HADAS members will remember the reprehensible events that took place around March 2011, when Barnet Council unilaterally closed the museum in this lovely old grade II* listed farm house, made the staff redundant, and sold off most of the collection of objects at auction. The house has stood empty ever since. However, at a meeting on 8th September 2014 the Assets, Regeneration and Growth Committee of Barnet Council approved a new plan for the building. The plan is to lease the building rent free to Middlesex University for seven years less a day and give the University £280,000 towards the regeneration (the council’s words) of the building. The university will take responsibility for the maintenance of the building and the grounds. The grounds will be available to the public. The University will use the building for educational meeting rooms and the arrangement also specifies that the building to be made available for community use from Monday to Friday evenings from 19.00 and on Saturday and Sunday from 0900. 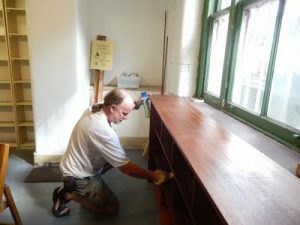 The bad news is we have lost our lovely local museum, the good news is this important local heritage asset will no longer be empty and deteriorating, but hopefully will be looked after at least for the next seven years. An exhibition inspired by the history of the artsdepot site, from the 19th Century Tally Ho Coach Company to the art deco Gaumont Cinema. Artist, Jacky Oliver, will work with the community to create a centrepiece for the exhibition which launches at artsdepot’s Fun Palace Birthday Bonanza on Sat 4 Oct. In 1996, workmen repairing a road in Lod (ancient Lydda) uncovered a large mosaic, thought to have covered the floor of the entrance hall or atrium of a wealthy resident 1,700 years ago. It is on display at Waddesdon Manor (NT) near Aylesbury until 2nd November. The exhibition has toured America and Europe, and this is its only UK venue. An octagonal centrepiece depicts lions and their prey, surrounded by individual panels showing various animals, birds and sea creatures. There are wide borders at each end showing more marine scenes. There are no humans, deities or seasons. The quality and condition of the mosaic are astonishing. In addition, there are a brief introductory video showing the discovery and lifting of the mosaic and a small exhibition of domestic Roman artefacts which will be familiar to HADAS members – especially as most have been borrowed from the BM! The display is in the Stable Block. Entry is free, but non-NT members may have to pay an entry fee to the grounds. Further details at www.waddesdon.org.uk or phone 01296 653226. 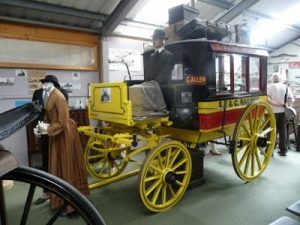 Tuesday was always going to be a challenging day, visiting Dungeness and the Romney Marsh, but we had not expected to lose half an hour stuck in traffic before reaching our first destination at Lydd, so our visits to the church and the local museum were slightly rushed. The word Dungeness is old English for the headland (ness) beyond Denge marsh. This headland is composed of sea-borne shingle derived by long-shore drift from the beaches of Brighton, Eastbourne, etc. to the west. The land is very barren and very flat, probably reaching no more than 5 foot above sea level at high tide. The annual rainfall is about 8 inches, which qualifies it as a desert. In the words of a friend of mine, “it is the land God forgot. At least 600 plant species can be found at Dungeness. This is surprising when one considers that the area has very low rainfall, and the shingle drains very quickly. Plants generally are adapted to the conditions by having long roots, fleshy leaves, the ability to fix nitrogen, or a certain amount of salt tolerance. When we were there, the wild flowers were spectacular. There were colourful stands of Viper’s Bugloss, Yellow Horned Poppy, Valerian, Restharrow, Wild Carrot and Sea Kale among many others. There are a few dwellings on the peninsula, and people seem to take the view that there is no point in trying to make a formal garden. Simply add a few rocks or driftwood and work with whatever wild flowers come along – and this is exactly what the power station has done outside its visitor centre. The flowers are important in supporting invertebrates, particularly bumble bees. Dungeness has the very rare Short-haired bumblebee, reintroduced in 2012 after going extinct in Britain in 1988, and also the Shrill carder bee, which was also thought to have disappeared from the area. There was a poster about bumblebees in the power station visitor centre, suggesting that they are trying to be sympathetic to the environment. Lydd Church is so unusually large for a parish church that it is called the Cathedral of the Marshes. It is 199 ft. long, and the tower is 132 ft. high and visible from afar. It is built over a Romano-British basilica of the 5th century and we could see some remaining arches of this buried in the wall in the north west corner. It was a church in the Anglo Saxon period, but most of the present church is medieval. As it was such a large and important church, many fraternities and guilds met here in the 15th century. Each guild met in a particular chapel or part of the church with their own altar and saint. The first rector recorded is Peter de Winchelsea in 1283. A later rector was Thomas Wolsey (later Cardinal Wolsey in the time of Henry VIII), but it is doubtful whether he spent much time here as he had many parishes and, no doubt, many tithes. The church was severely damaged by bombing in World War II. The chancel was destroyed, but was well restored, leaving out the Victorian ‘improvements’. The modern stained glass windows over the altar are very pleasing and elsewhere the windows are mostly plain glass so that the church is flooded with light. On the floor and north wall there are some brasses which depict the well clothed, well-heeled merchants of Lydd during the period between 1557 and 1616 when the wool trade flourished. In the North Chapel there is an effigy of Sir Walter de Meryl, a Crusader in chain mail and armour. There is also a very colourful bust of Thomas Godfrey and above it the coats of arms of his ‘three severall wives’. He lived to see his children ‘well disposed of in marriadge into severall worthy families & to see parents of many hopefull children to his great comfort’. Surely the wish of all parents. Lydd Museum is run by volunteers, who had kindly agreed to open it for us. It is housed in the old fire station, and an old hand-pumped engine stands outside. 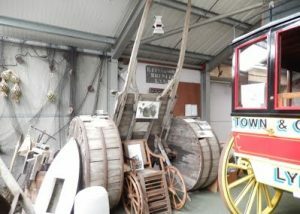 The exhibits include some interesting wheeled exhibits including a horse drawn bus used to take passengers to the railway station. Not sufficient for a HADAS outing. Rather more interesting was a large wheeled cart. 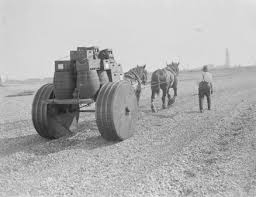 Faced with the problem of bringing fish from their boats across the shingle, special carts with wide wooden wheels were developed (see photo). The wheels seem to owe something to the skills of a barrel-maker. In front of the cart is a wooden wheelchair. The photo of a cart in use seems to show a lighthouse of which more next month. And what should we find on a building next to the church? 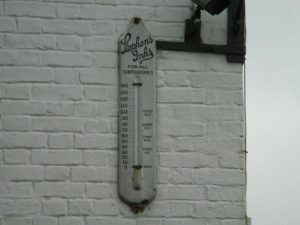 A Stephens Thermometer! We passed the Rype in Lydd which is a very large flat area, a remnant of marshland.It recalled to me the neighbouring Lydd (Ferryfield) airfield from which my wife and I flew in 1956. The short route Lydd-Le Touquet was flown by Silver City Airways, carrying 3 cars and up to 10 passengers. The bonnet of our Ford Anglia had to be opened for inspection, revealing our flat camping kettle wedged on top of the engine. My explanation was accepted that it was a quick method of having heated water ready for boiling for tea when we stopped. On the third day of our trip, Tuesday 1st. July 2014 we visited the Dungeness B Power Station. What a contrast to our visit in Canterbury on the first day. The towering Dungeness Power Station matched Canterbury Cathedral in its proportions, as dedicated to energy production as the latter was to prayer. 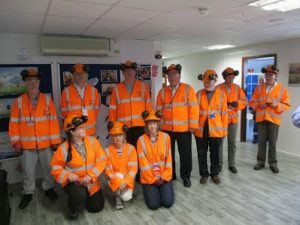 As a group we visited the award winning visitor centre which gave us the opportunity of enjoying the interactive exhibition zone before 10 of us embarked on a site tour to see the plant in operation with the rest of the group going off to see the Dungeness Lifeboat Station. The tour itself around the plant lasted just over one and a half hours. We were all kitted out in special clothing plus a special electronic device which allowed us to hear (as well as communicate) all that was said to us. The plant is owned and run by EDF Energy, one of the UK’s largest energy companies as well as being the biggest producer of low carbon electricity. What is more EDF Energy is one of the three largest energy companies in Europe. We learnt about nuclear safety (always an over-riding priority), how a nuclear reactor works and how electricity is generated. On the technical front we learnt something about ionising radiation and nuclear waste disposal [nuclear waste products are classified into three categories – high, intermediate and low level – based on how radioactive they are, and this determines how they are treated]. We also discovered that an episode of Dr Who had been filmed on the site. O ur guides for the tour were Jo and Sarah. Their fluency of delivery, their knowledge, passion and enthusiasm was simply breath taking. More impressive was their supreme ability to explain and reduce complex ideas and processes in accessible layman’s language. Dungeness B has also picked-up and learnt lessons from the tragic disaster of Fukushima Daiichi Nuclear Power Station in Japan which flooded with sea water causing further problems in an already dire situation. A new retaining wall has been built around Dungeness B to prevent similar flooding, in the event of a disaster. EDF’s commitment to safety is impressive. Finally, but not least, EDF has been awarded the Wildlife Trusts’ Biodiversity Benchmark in recognition of its work to protect the unique flora and fauna of the vegetated shingle around the Power Station . On this year’s HADAS excursion we have been privileged to see two different Cathedrals: one dedicated to Spiritual power and the other to Nuclear! A memorable experience, indeed. Anyone looking at a map of southern England would pick out the narrows where the English Channel meets the North Sea. The distance between Dungeness and Cap Griz Nez is about 25 miles and this strait, known as the Dover Strait, caters for most of the mercantile shipping bound to and from Europe. The possibilities for maritime disaster are unlimited. The situation was exactly the same in the 1820s and the recently formed Royal National Lifeboat Institution decided to do something about it. In 1826, they planted a lifeboat station at the tip of Dungeness. This lapsed from use in 1839 but was revived in 1854 and continues to the present day. 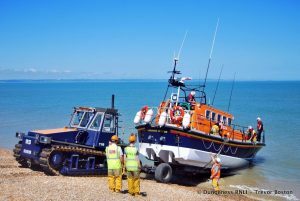 There are presently three methods of launching a lifeboat; down a slipway from a lifeboat house, from an anchorage in a harbour or from a beach. The Dungeness boat has always been launched from a beach. Originally a very large, sturdy rowing boat with mast and sails stowed and the crew aboard, mounted on a cradle if one was available, would be pushed into the sea by horses, with the launch and recovery crew using ropes to keep the boat facing into the seas. At this time, the women of the community often played a prominent part in the process, as indeed they still do. Once launched, they would take shelter and wait for the boat’s return. Sometimes it did not. But usually it did and the then recovery part of the process would take place. Nowadays things are a little different, but not entirely; mechanisation has just taken over. The boathouse is about 100 yards from the sea and this difference is traversed by the cradle – which holds the boat – and the tractor which pushes it. Both items of equipment are mounted on tracks, about 4 foot wide at a guess, running over 7 idler wheels with propulsion wheels at each end powered by a diesel engine. I imagine the tractor is waterproofed. Top speed is about 1-2 miles per hour and the entire system, at least 60 feet long, and weighing in the region of 40 tons with the boat on board. On reaching the sea, an arm extends to push the boat out at the same time as the cradle bed slopes to allow gravity to assist. The boat is usually launched bow first. The tractor driver can launch the boat by himself if necessary. The tractor cost £1,500.000 pounds. The boat is a very new one, the first of the Shannon class in service. Made of fibre reinforced plastic, it weighs 18 tons and has a crew of 6. Its capacity is 23 survivors with its self-righting facility or 79 without it. Coxswain Stuart Adams explained how this worked. When the cabin is sealed, the air-bubble and the low position of the heavy engines bring the boat upright. The main attraction of the boat is its speed. At 25 knots (30 mph), it IS fast. I remember being told in my youth that 8 knots was the most they could do – any faster and the crew would be washed out of it. In the Shannon class however, the crew are all in the cabin unless the upper steering position is manned, which is not likely when making a passage at speed in rough weather. The two engines at 650 hp each operating twin water jets, which means that the manoeuvrability is “phenomenal” and it can be beached without damage. The crew are seated two by two in the cabin strapped opposite their screens. Each man has his own position with the helmsman front left. The screens are interchangeable and can show inter alia the radar pictures from Dover Coastguard and the boat and cctv pictures from the boat. The crew have headsets and intercoms. But some things do not change. The RNLI is strictly voluntary, as it always has been. It exists on donations and bequests from the public. The only crew members that may be paid are the coxswain and the engineer, whose job it is to ensure that the engines are fully functional at all times. As there is a training launch every fortnight and no one knows when a real call-out may come, this is a matter of necessity. Each time the Dungeness boat is launched costs £4,500. With 237 stations to maintain throughout the British Isles, the cost to the RNLI is about two and a half million pounds per week. Although the crew totals 6, the number of persons trained to operate the boat is about 30. The ideal is to have everybody trained to fulfil two or three roles on the boat, and the same goes for the launch crew. It is, as the coxswain pointed out, worrying to find on a call-out, that nobody present can drive the tractor. It takes 20 minutes to launch the boat from the moment that the pagers go off, and each crew member must live within 3 miles of the boat house. When the station was founded, sailing ships were the bulk of the “customers”; in essence they still are, but they no longer carry heavy goods, nor are they so big. The introduction of lanes in the channel, constant patrolling by coast guard vessels, radio warnings, to say nothing of international safety agreements, have much reduced the problem, but not entirely. Nowadays the problem is yachts and small cabin cruisers, and worst of all a basic lack of skills. This is epitomised by a boat that was obviously in trouble and when asked what charts they had, held up a copy of the A-Z. They were from London and hoped to sail to Liverpool. The school summer holidays are known as “Purgatory” in the lifeboat house. Believing that prevention is better than cure, the RNLI has encouraged their crews to give talks and demonstrations of the safe way to sail and to demonstrate the basic level of safety kit. Perhaps the most basic lesson is how to get the lifeboat. Simple: dial 999 and ask for the coastguard. They will work out what area is involved and alert the relevant boats. In the case of Dungeness, their area extends from Dover westwards to Rye. Obviously they do not have to stick to these limits – they are for guidance only. The name of the boat is “The Morrell”; a tribute to a very generous bequest given by Mrs Barbara Morrell of Bromley in Kent. The full amount of the legacy was six million pounds from which the boat and tractor cost three and a half million. But the lifeboats have a way of supporting themselves. Last year, the Dungeness team raised £51,000 for the rescue services and the Church, holding concerts, bingo sessions, brass band events, etc. and acting as an information centre. Then a short ride to Lydia’s lighthouse, where we were to meet up again with group one. But that’s for next month. Tuesday 30th October, 8pm Finchley Society, Drawing Room, Stephens House & Gardens (formerly Avenue House), East End Road, N3 3QE. Church End Town Centre: Where to Next? Discussion addressed by Dennis Pepper. Also feedback from Finchley in Bloom and a picture quiz. Non-members £2. Further details to September newsletter. Friday 31st October, 6.30pm Friends of the Petrie Museum, UCL Lecture Theatre G6, Institute of Archaeology, 31 Gordon Square WC1. What Did Petrie & The Ancient Egyptians Ever Do For Bolton? Talk by Jacqueline Hyman. Saturday 1st November, 10.30am – 4.30pm G.A.Festival of Geology, UCL, Gower Street, WC1E 6BT. Displays by Geologists Association members & affiliated clubs (Amateur Geological Society will have a stand here), sales of fossils, minerals, books, maps & geological equipment, amateur photographic competition, geological talks. Also walks & field trips on Sunday 2nd November. Free. Sunday 2nd November, 10.30am Heath & Hampstead Society The Heath & Kenwood – How They Relate to Each Other. Meet at entrance to Old Kitchen Garden east of Kenwood House. Walk (leaders TBA). Lasts approx. 2hrs. £3. Wednesday 12th November, 2.30pm Mill Hill Historical Society Trinity Church, The Broadway, NW7. Garden Cities: History & Development. Talk by Josh Tidy. Wednesday 12th November, 7.45pm Hornsey Historical Society Union Church Hall, corner Ferme Park Road/Weston Park, N8 9PX. The Friern Hospital Story. Talk by David Berguer (Chair Friern Barnet L.H.S.) Visitors £3. Refreshments & sales 7.30pm. Friday 14th November, 6.30pm Friends of the Petrie Museum UCL Lecture Theatre G6, Institute of Archaeology, 31 Gordon Square WC1. Living in a Cultic Landscape: The Khentkawes Settlement at Giza. Talk by Ana Tavares. Thursday 27th November, 8pm Finchley Society, Drawing Room, Stephens House & Gardens (formerly Avenue House), East End Road, N3 3QE. Xmas in London. Jean Scott Memorial Lecture given by Brenda Cole. Non-members £2. Saturday 29th November, 10.15am – 3.30pm Amateur Geological Society’s Mineral & Fossil Bazaar St. Mary’s Hall, Hendon Lane, N3 1TR. Including rocks, books, crystals, gemstones, jewellery. Refreshments. Admission £1.